Do you have natural spellers at your house? Spelling is not a favorite subject at my house. And as the kid who went to spelling bees, it hurts me that my kids aren’t better spellers. We had much crying, whining, and complaining over spelling until we found our current spelling program – All About Spelling. And while we still do have occasional complaints, we’ve had fewer arguments during spelling time, and more importantly, my kids are making real progress! My oldest has made it through 4 levels of this spelling program and is just about to finish up the 5th level. So I wanted to share with you what we love about this program and what Level 5 of All About Spelling is really like. I started my oldest (who is now in 6th grade) back in level 1 when she was in 3rd or 4th grade. We’ve completed more than 1 level per year. But I wanted to make sure she understood all the rules and had a really solid foundation. So many of these rules were new to me. I really felt I learned quite a bit alongside my daughter as we progressed through this level. Each lesson begins with new teaching – learning new sounds or new rules. These rules are meant to be demonstrated with the tiles (I sometimes use a whiteboard). Some lessons include a word bank of common words that follow this new rule. We read through this many times during the course of the level. I’ve found it really helps cement the proper spellings of these words in my daughter’s mind. The more she sees the word spelled correctly, the more likely it is that she will remember how to spell it correctly herself. There are 10 spelling words for almost every lesson. And sometimes there are a few extra words for extra practice. Some lessons include a homophone review. A homophone pair is listed and the student must chose which word is used in the sentences that are read by the teacher. This is a great way to have a simple vocabulary discussion. Each lesson also contains dictation sentences. These are meant to be spread throughout the course of each lesson for practice and reinforcement. And the lessons end with a writing station where the student is given 6 words to use in sentences. 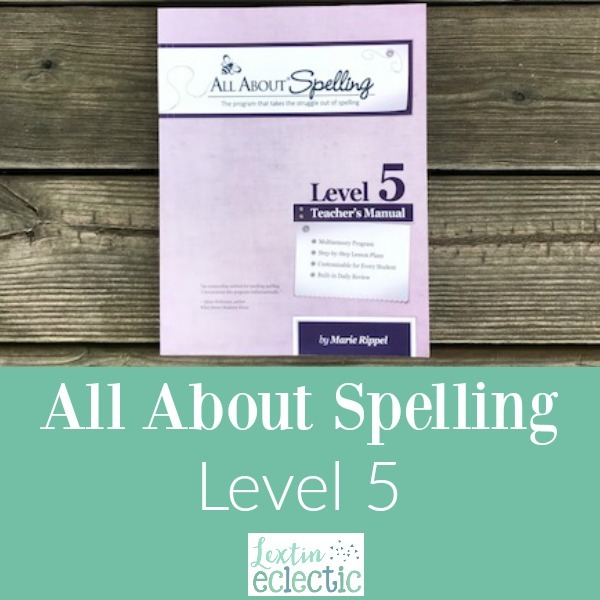 We have loved using Level 5 as I feel that this level has quite a few advanced rules – many of which are new to me. Because we’re using the program a little bit “behind” where my daughter might have placed, we have moved through the levels at a faster pace of about 2 levels per year. And some levels we have even completed twice! I usually cover a lesson or two per week as long as my daughter understands the concept. My favorite part of each lesson is the dictation sentences. I have found that when teaching spelling, my children do very well with spelling concepts during our structured spelling time. However, once they are working in another subject, they often forget all the spelling rules and don’t apply any of them to their writing. This has made me feel like a complete failure as a spelling teacher. I have learned, though, that this is completely normal. I have found that the dictation section in each lesson has been instrumental in helping my kids apply spelling concepts across all their subjects. As my daughter completes the dictation sentences in this level, I can assess which words and rules are still challenging for her. This helps me adjust the review words and I can make sure to go over those words more frequently. My second favorite section is the writing station where my daughter writes her own sentences based on the 6 words that I give her. This has been so beneficial in helping her apply the various spelling rules to her writing in other subjects. I really appreciate how the program is divided into individual lessons (which are called steps). It is very incremental and not overwhelming for a child who struggles with spelling. Overall, I’m so thankful that we found a spelling program that is easy for me to use and that has great built-in review for my kids who are not strong spellers. We’ve worked through the program at our own pace with lots of review (even repeating entire levels as needed). However, I can tell that my kids are building a strong foundation for spelling and their steady improvement year after year has proven that this program works so well for them!